It's been a while since we feel it in trends, simplicity is back in a big way. We opt for simple elements, with a Scandinavian appearance, which will create a soft and modern look. 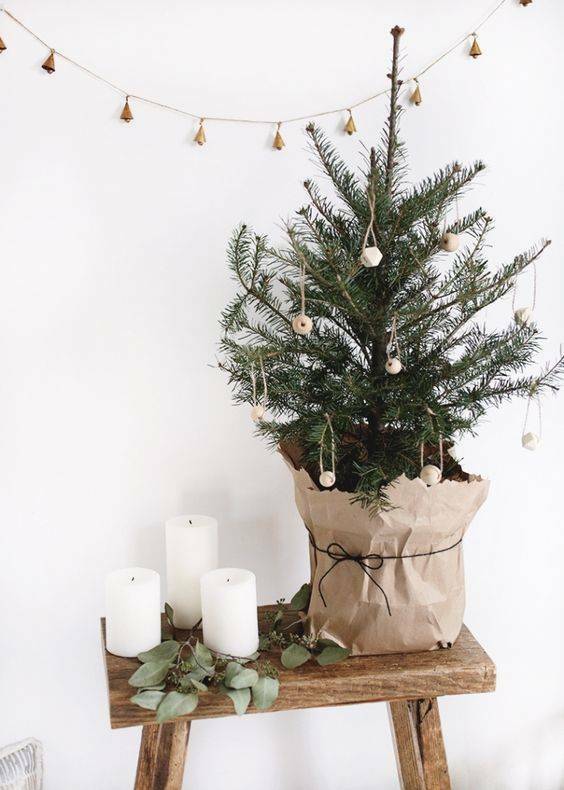 Small monochrome trees, bells and white candles are all essential elements to complete this look. For the walls, we opt for pretty green wreaths and garlands made of wood beads that will add texture to your decor. Keep it sparse and light this year! For the Christmas tree, we opt for an ultra sleek look by putting almost no ornaments or decorations in it. If you love ornaments like us tough, opt for only a few models in the same color palette. Finish it all with clear lights. Also choose a beautiful rattan basket to put the foot of the tree in. For gift wrapping, we opt for kraft or white paper and we complete the whole thing with simple string and greenery for a nice touch. And voila. you are all set ! Have a happy holiday everyone !